Vinu Thomas is an upcoming music director in the Malayalam film industry. If one watches his ascent to the limelight, one can see that he has carved his niche in the industry by means of sheer hard work and the right aptitude to towards his work. Before his music directorial debut in the industry, he was primarily working as an advocate in his hometown of Thiruvalla, following his parents' footsteps. He was in this profession for a year, before the twist of destiny took him to an unbelievable direction in the film industry. Thiruvalla is a popular city on the map of Malayalam film industry as many of popular faces in the movie industry like director Blessy, actress Nayanthara, Meera Jasmine, etc. hail from this small town in the central Kerala. In keeping with the name of the village, Vinu Thomas has shown his presence in Malayalam and Telugu movies with his heart-steering and long-lingering music. The first movie for which he gave soulful music was 'Of The People' in the Malayalam film industry. His work in the latest film Drishyam was appreciated by the film-loving people of the state. Almost all the songs in the film were instant hits and the people received these songs with whole heart. Vinu Thomas was born into a Christian family in a small town called Thiuvalla in Pathanamthitta district of central Kerala. His father and mother are practicing advocates in their hometown. In order to keep hopes about their son high, they put him in a reputed school in Thiruvalla. In that school, he completed his formal and secondary education with distinction. After his schooling, he joined a local college for his pre-degree course and completed it successfully. Following his parents' footsteps, he enrolled himself for a degree in Law. During his college years, he was active in cultural and academic programs. Due to his extra-curricular interests, he later on developed and honed his skills in music. As per the expectations of his parents, he passed the L.L.B. course with flying colors and distinction. He immediately started working as a junior advocate under a famous lawyer in his hometown. He worked there for nearly a year, before venturing into the world of cinema. Right from the childhood days, Vinu Thomas was much popular amongst his classmates for his versatile talents. During those formative days, he had shown interest in music and a great passion towards singing. As a child, he used to take pride in singing popular numbers of his time before his friends and relatives. At the tender age of 18 years, he composed his maiden music album. This album was a Christian devotional album titled 'Divya Santhwanam'. The tunes of this album had a magical touch in the minds of the people in his locality as many of the songs had captured the imagination of the people. After a while, his parents realized that their boy had chosen a wrong profession due to their compulsion. Hence, he was given a free hand to choose his profession. This gave him the required impetus to work hard in his area of interest creatively. Initially, he started his creative work by making some Advertisement films. During those early days, he met with Tanu Balak who was a known advertisement film maker. With his assistance, Vinu tried to pick up some assignments in the advertisement industry and became an independent advertisement maker. Since his childhood, Vinu Thomas had struggled a lot to learn music and tried to convince his parents regarding his immense talents in it. At the age of 10 years and after lots of persuasion, he was initiated into the world of Carnatic music from a Christian Missionary Music School. In this music school, he learned the first lessons of Carnatic music from an able teacher Senu. During his association with this school, he developed a deep interest in the music. According to his own words, Master Senu was his mentor during his early days in his pursuit for true music. Hence, he held his music master in high esteem. After his resolution in favor of building his career around music, decided to concentrate more on the field of music and find himself a place in the movie world. As a result of this resolution, he found himself giving lives to different advertisement films through his unique brand of music. After getting the consent from his parents to go ahead in his field of choice, Vinu Thomas began to do work on advertisement films. In advertisement films, he gave life by scoring soulful music in them. When he began his work in advertisement films, he chanced upon Tanu Balak who was one of the reputed advertisement filmmakers in that point in time. That meeting turned out to be a turning point in his life. Tanu Balak has a large number of connections in both advertisement and movie industries. Apart from advertisement films, he also worked on Malayalam movie projects as Cinematographer. A notable association Tanu had with the ace film maker Jayaraj is worth mentioning in this context. The first two films for which Tanu Balak associated with Jayaraj were 'Of The People' and 'The Train'. With the help of Tanu Balak, Vinu Thomas started doing his advertisement films independently. Vinu's works started getting the required attention from various quarters. Hence, he started getting opportunities to work with big-ticket business groups in the state. The companies or the business groups for which he made commercials were Malayala Manorama, Sunidra Matress, Veegaland, V Guard, Sapil, Mathrubhoomi, AVT Tea, etc. With this transformation, he began reckoned as a reputed advertisement film maker in the state. After having introduced to Jayaraj, Vinu Thomas joined him to make few popular advertisement films. The style of working of Vinu Thomas and his attitude towards the work impressed the movie maker Jayaraj very much. Hence, he decided to give the young music director a chance to prove his mettle in his upcoming project 'For the People'. After the success in the first film, Jayaraj did not think second time before assigning the task of music direction to Vinu Thomas in his third sequel of his original movie 'Of The People'. As expected all the songs in the movie proved to be hit and they topped the chart before the release of the movie. Since these songs had a magical wand to wield the imagination of the people, they became the household tunes in the state. Despite of the popularity of the songs, the movie 'Of the People' didn't go well at the box office. As a result of his success in the earlier Malayalam films, he began to be counted as a reputed music director in the field. Thus, other popular filmmakers in the industry started to come after him to score tunes for their films. Looking at the merits of the movie and the quality of lyrics, he chose to work for the movies such as Doctor Love, Not Out, Lissayammayude Veedu, etc. As before his musical scores became huge hits with the audience in the state. Later, he we introduced in the Tollywood to take up an assignment for a Telugu movie titled 'Ankith, Pallavi and Friends'. This Telugu language film was directed by Hari Yelleti. The young musician from Kerala could make the Telugu audience dance to his colorful tune and get recognition from other movie makers in the region. With neck-to-neck competition existing in the Tollywood, the performance of the young boy was a surprise to the Telugu audience, with many positive reviews coming his way. In the year 2013, he came up with nice scores for two films that again created a movement in the Malayalam movie industry. One was a full-fledged feature film titled Drishyam and the other was a short fictional film by the name Athe Karanathaal. The feature film had megastar Mohanlal and veteran actress Meena in lead roles. The movie was a huge hit at the box office of the state with the collection crossing Rs. 19.6 crores in just 25 days. In this film, Anil Johnson was part of the team that set the tunes for the movie songs. All the songs in the film were hits with the audience. The film got the attention it deserved mainly due to the melodious songs and veritable plots using the central characters. In the other work in the short film, he composed music that truly imbibed the climate and the plot of the movie. The theme music scored by Vinu Thomas set the film rolling in an effective way. The Telugu audience will get yet another chance to hear his sparkling songs through the upcoming movie Chal Chal. This film is being directed by Varma S. Epuri. This film is a fun-filled romantic entertainer movie. The main projected hallmark of this movie is the package of melodious songs and fast numbers that could keep the Telugu audience glued to the silver screen. The theme song of the movie has now become the talk of the tinsel town. With large expectations of the movie hovering around, the movie lovers can expect more songs from the movie when it will be released in the coming year. Vinu Thomas is the new music sensation in the world of cinema. 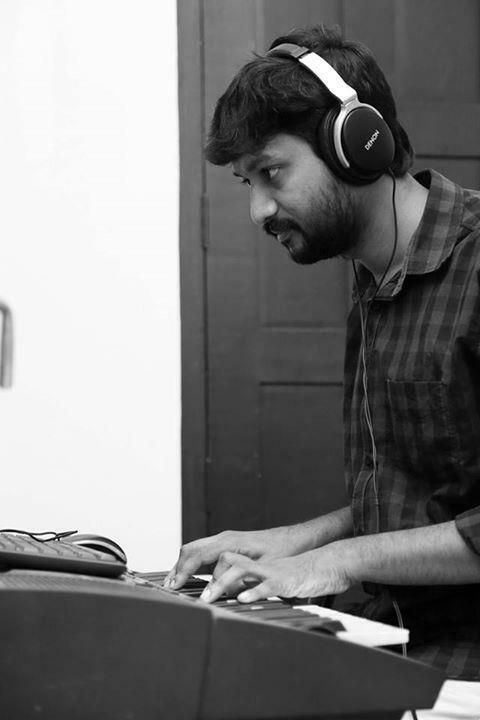 Having born to the advocate parents and no history of music in the family, he has carved his niche as a film music director in the industry through his hard work and commitment to the work. Right from the childhood, he was interested in the music. At the tender age of 18 years, he directed a Malayalam Christian devotional album titled Divya Santhwanam. All the songs of this devotional album became instant hits amongst the Christian devotees of the region. He earned himself a recognition by scoring melodies in a number of advertisement films for various business groups and companies in the state. Through his association with ace advertisement film maker Tarun Balak, he gained his entry into the film world. With the help of the ace director, he got a chance to compose songs in a movie titled 'Of The People'. The film went down the history for the musical numbers scored by him, not for the plot of the movie. After his success in the movie, he began getting more offers from other film makers across the South India. As a result, he happened to work with Hair Yellati and Kishore to compose some of the best songs in Telugu movies such as 'Ankith, Pallavi and Friends'. Through his brand of music, he could breathe fire and life in many new movies that have come in past two years. The latest example is the movie titled Drishyam. The music of this film was a huge hit with the audience. Some of the songs were composed by Vinu Thomas himself.